When the globe began to swing like a pendulum, sending stars careening around the dark theater to create the wild tempest that opens the play, I knew we were in good hands. Karin Coonrod directs The Tempest with clarity, simplicity, and subtle magic. Magic is, of course, a plot element in this tale of the magically – and revenge — inclined Prospero, the betrayed former Duke of Milan. What I hadn’t realized was how frequently music is mentioned in the text. Coonrod and composer Elizabeth Swados lift the words off the page and create not just melodies for characters to sing but soundscapes and spells. This adds an enchanting texture to the stripped-down production that never feels thin. For those who skipped that day in class, the basic story is that Prospero was betrayed by his brother Antonio (Earl Baker, Jr.) in cahoots with King Alonso (Angus Hepburn). Prospero and his three-year-old daughter were kidnapped and set adrift at sea and left to die on a raft. They found refuge on an island and now, twelve years later, Prospero has conspired to accomplish two things with a single raging storm: avenge the wrongdoing and provide Miranda (Miriam A. Hyman) with a happily-ever-after. He wrecks the king’s ship, whose party includes Ferdinand, the king’s son (Christopher McLinden) — and Prospero’s chosen son-in-law to be. Prospero doesn’t manage this alone: Ariel (Joseph Harrington), a spirit, acts at Prospero’s bidding. If Ariel could be considered Prospero’s indentured servant, the “monster” Caliban (Slate Holmgren) is Prospero’s slave. Watching both of these characters prostrate themselves at Prospero’s feet is appropriately uncomfortable. The Tempest can be (and has been) an examination of colonialism, with Prospero as a deeply morally ambiguous character. The complicated relationships this master has wth his two “servants” is well captured, as Ariel worries his promised freedom may never come and Caliban rages at his imprisonment. Reg E. Cathey captures Prospero’s changeable nature: loving father, imperious master, scheming manipulator, and ultimately a weary man ready to relinquish his power. Stand-outs in this very strong cast are Sorab Wadia, sneakily funny as the plotting nobleman Sebastian, Tony Torn as the drunken butler Stephano, a classic Shakespeare buffoon, and especially Holmgren as Caliban. Holmgren’s fully committed rage, outrage, menace, and humiliation are compelling to watch and serve to make the moment he is finally granted his freedom deeply moving. His powerful performance, and Harrington’s vulnerability as Ariel, underscore the complexity of the question of whose side we’re on, adding to this production’s palpable immediacy. We pay very close attention. This isn’t a production without flaws: I found Harrington a curious casting choice. Ariel lives in the shadow of Puck, but to me is a far more interesting character because of his contradictory yearning for freedom while needing Prospero’s love. Harrington embodies this predicament well but with his well-scrubbed freshness and uniform-like costume comes across a bit as a dancing Boy Scout, making me wonder about Coonrod’s concept for this non-human role. Additionally, the pageant Prospero provides for his daughter’s wedding is surprisingly dull. Swados’s music is lovely, but the lone woman manipulating a scarf doesn’t satisfy the text’s promise of a parade of goddesses, and is frankly boring. However, none of this detracts from what is a delightful evening, and an excellent production for those who find Shakespeare difficult to follow. Subtle magic isn’t showy, but it can certainly be effective. 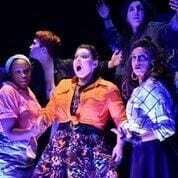 Musical direction by Soon Yeon Lee, scenic design by Riccardo Hernandez, costumes by Oana Botez, lights by Christopher Akerlind, puppets by Vickie Fremont, and choreography by Cara Kjellman. Opens October 9; Wednesday through Saturday until November 2nd.